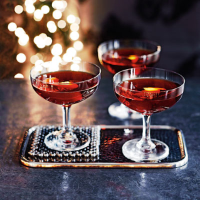 Wonderfully warming on winter days, sloe gin is also a good base for creating festive cocktails. 1. Measure the ingredients into a cocktail shaker, add ice and stir. 2. Strain the mixture into a chilled glass (keep it in the fridge for an hour or so beforehand). 3. Squeeze the lemon peel over the drink to release its oil, then drop it into the glass and serve.